When this piece first came to The Center, it was rolled on a tube and our client thought it was a painting. However, it wasn't long before the work’s true story began to unfold. Our client had recently purchased the large-scale piece from its long-term owner, and knew the work was in need of care. The piece had been on display in a private residence for many years using metal clips at the top two corners. The installation on the wall was similar to how the artist had displayed the work in previous exhibitions. The corners where the sheet had been hung exhibited areas of stress and tears, as well as what appeared to be oxidized rust stains caused by the metal clips. When our conservators carefully unrolled the large piece from the tube, they noted the overall condition of the work from years of display and exposure. The piece exhibited moderate to severe curling along all edges. There was distortion overall, with severe corner draws in the upper left and right corners. In addition to overall age-related conditions throughout, there was extensive dust and surface soil on both the recto and verso (front and back) of the piece. 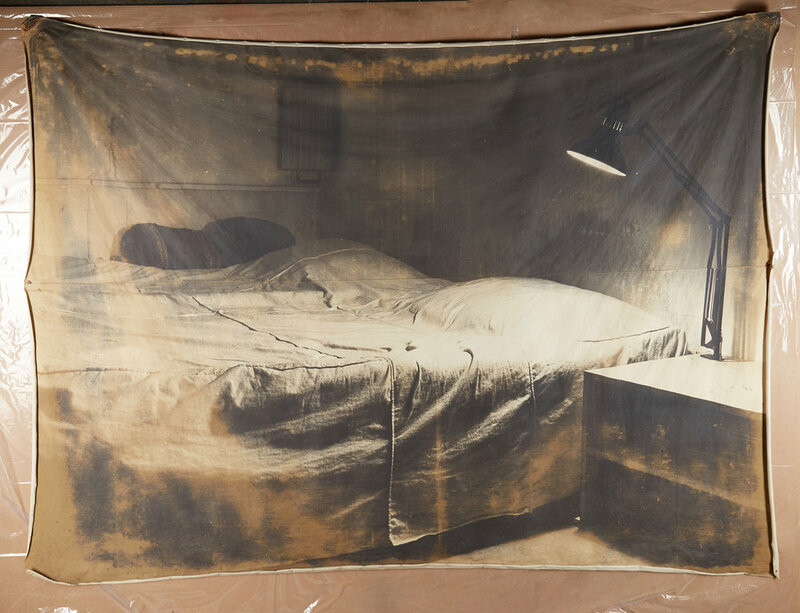 After careful examination, collaboration, and research, our conservators concluded the work was not a painting but instead a photographic emulsion on a textile support. This piece in particular is unusual due to the scale and its seamed construction, as well as the fact the work is an artist's proof that was thought to no longer be in existence. The piece exhibited a horizontal seam through the middle, and the top half of the seamed photograph appeared to be more brittle than the bottom section. 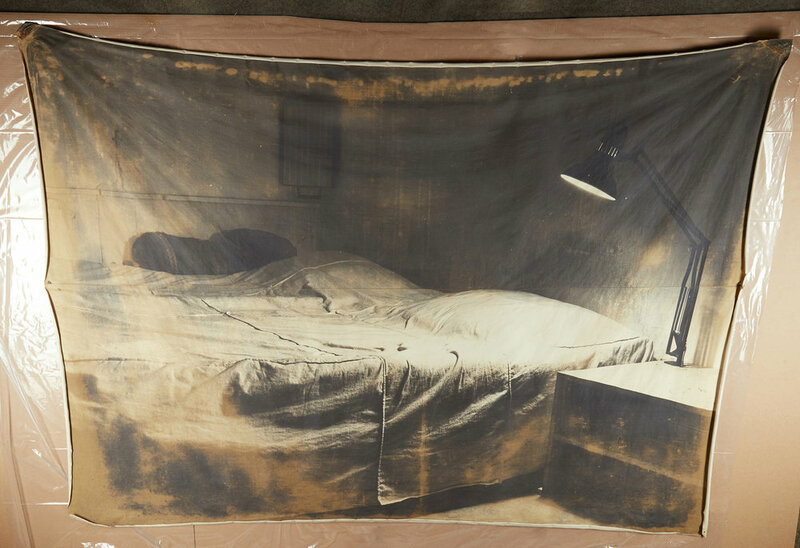 Our conservators believed this may have been due to a light source being near the sheet during its time on display with the previous owner, as well as the manner in which the artist prepared and processed the photograph. The overall image also exhibited evidence of oxidation that may have been a result of the work being an artist’s proof, as well as the artist’s inherent process of developing the image. As our conservators continued their examinations and research, an interesting story began to develop. In hopes of discovering who created the work and making contact with them to discuss potential treatment options, we came across a similar piece online under the name of Markus Raetz. This information led us to the widow of Balthasar Burkhard, who eagerly shared information with us about the history of the work. She explained that Burkhard began collaborating with Raetz in Switzerland during the 1960s to develop large-scale works using the technique of applying a negative to soft canvases. Although Burkhard was from Switzerland, he lived in Chicago from 1975-1978, during which time he taught at the University of Illinois as a Visiting Lecturer of Photography. In 1977, he had his first solo exhibition at Zolla Lieberman Gallery, and in 1980 he would exhibit at the Hyde Part Art Center. Burkhard's widow told us that little to no documentation regarding conservation of Burkhard’s photo canvases or similar artists' work existed. Combining our research with the information she told us, we entered into the testing phase for treatment. Some of the major factors that needed to be considered to determine the correct treatment approach were the distortion, age, scale, gelatin’s receptive nature to moisture, and the seamed construction of the work. Our conservators began by conducting testing in small areas of the work using conservation-grade erasers. After observing that this approach showed a reduction of the surface soil, the eraser crumbs were removed with a soft brush and vacuum. Next, they selectively tested other areas of the piece using filtered water; these tests showed that the overall surface of the image was stable. Next, areas of the piece were blotter dried. Our conservators observed that after this phase of testing the piece exhibited a softer feel. They then concluded that the humidification process re-hydrated and relaxed both the textile fibers and gelatin layer of the piece. We proceeded with surface cleaning the piece using erasers, and the crumbs were then vacuumed away. Loose dirt on the curling edges of the piece was also carefully vacuumed away. The curled edges and the upper seam of the piece piece were locally humidified gradually in sections before being placed under weights to reduce the distortion and tightness of the curling. Areas were then weighted with blotters to further aid in reduction of distortion. The small tears and the upper corners were treated on the verso with a conservation-grade adhesive. To aid in visual discrepancies, selected areas of fills were toned with conservation-grade paints. Our conservators are still in discussion with the owner of the photograph to determine the best way to display the piece post-treatment. As the clips were part of the artist’s intention for the work, we will remain dedicated to incorporating them into an archival and safe display option to preserve this important piece and the story behind it for generations to come.